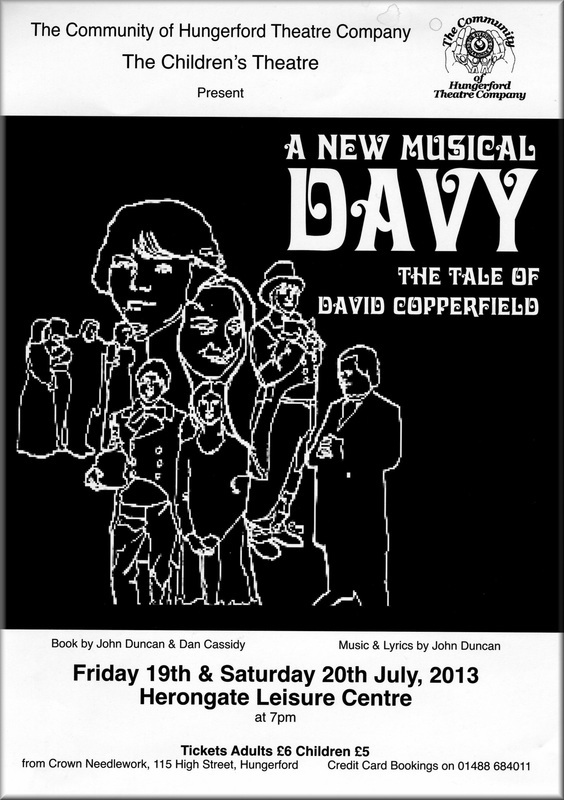 The 2013 CHILDREN'S THEATRE success was DAVY, a musical based on the early life of David Copperfield by Charles Dickens. Music and Lyrics by John Duncan. Davy is based on the early life of David Copperfield by Charles Dickens. It covers the period from Davy’s birth to his reconciliation with his Aunt Betsey Trotwood who had stormed out of the Copperfield house on the day that he was born because Aunt Betsey wanted a girl. “I’ll have no boy!” she cries as she leaves the house. Davy’s early life is filled with tragedy. He was born after the death of his father. When Davy was eleven years old his mother married Mr. Murdstone, a cruel and brutal man who beats Davy for getting his lessons wrong. He sends Davy to school where he meets the horrible headmaster, Creakle and his assistant Tungay, along with the pupils of the school including Traddles and Steerforth. After the death of his mother, Davy is sent to London to work in his step-fathers wine house where he must wash and clean bottles all day long. He obtains lodgings with Mr and Mrs Micawber who have severe financial difficulties. Mr Micawber will be sent to a debtors’ prison if he fails to pay all his creditors. For Davy the situation looks hopeless so he decides to run away to Dover to find his Aunt Betsey.